After an intense week with line by line review of the Summary for Policymakers the Synthesis Report was approved Saturday 1. November in Copenhagen, Denmark, and Dr. Rajendra Pachauri and the core writing team could finally release the main findings at the press conference. This is the last report of the Fifth Assessment Report and it synthesizes and integrates the findings of the three Working Group reports: The Physical Science Basis, Impacts (September 2013), Adaptation and Vulnerability (March 2014) and Mitigation of Climate Change (April 2014).The Synthesis Report is seen as the most important report for policymaker and stakeholders. Almost 6 years has passed since the Fifth Assessment Report process started and now we are left with a very clear and distilled story about climate change. In just about 100 pages it tells the story of why climate change is a problem, what is causing climate change, what the consequences are, and what we can do about it. The story is different than from the separate Working group reports as it is much more integrating, and key messages comes across even stronger as the problem, the consequences and the solutions space is brought more together. …Synthesis Report shows that solutions are at hand. Tremendous strides are being made in alternative sources of clean energy. There is much we can do to use energy more efficiently. Reducing and ultimately eliminating deforestation provides additional avenues for action. This is not to say it will be easy. It won’t. A great deal of work and tall hurdles lie ahead. But it can be done. We still have time to build a better, more sustainable world. We still have time to avoid the most serious impacts of climate change. But we have precious little of that time. Warming is unequivocal; observed changes are unprecedented; atmosphere and ocean have warmed, snow and ice reduced, and sea level risen. GHG emissions growth between 2000 and 2010 has been larger than in the previous three decades. Anthropogenic greenhouse gas emissions have increased since the pre-industrial era, driven largely by economic and population growth, and are now higher than ever. The levels of athmospheric concentrations of carbon dioxide, methane and nitrous oxide are unprecedented in at least the last 800,000 years. Climate changes have had widespread impacts on humans and nature, on all continents and in the oceans, affecting rich and poor countries. Some of the changes in extreme weather and climate events observed since about 1950 have been linked to human influence. Continued emissions of greenhouse gases will cause further warming and changes in the climate system. Risk of irreversible changes increase with warming. We need both adaptation and mitigation. Effective adaptation and mitigation responses will depend on policies and measures across multiple scales: regional, national and sub-national. Adaptation can reduce the risks of climate change impacts, but there are limits to its effectiveness. Some adaptation responses involve significant co-benefits, synergies, and trade-offs. Increasing climate change will increase challenges for many adaptation options. Adaptation and mitigation responses are underpinned by common enabling factors. Measures exist to achieve the substantial emissions reductions required to limit likely warming to 2°C. Implementing reductions in greenhouse gas emissions poses substantial technological, economic, social, and institutional challenges. The more we delay our responses the greater the risk of severe, widespread and irreversible impacts; and the greater the costs. Stabilization of atmospheric concentrations requires moving away from the baseline – regardless of the mitigation goal. Delaying mitigation increases the difficulty and narrows the options for limiting warming to 2°C. We have the options to limit climate change and build a more prosperous, sustainable future. 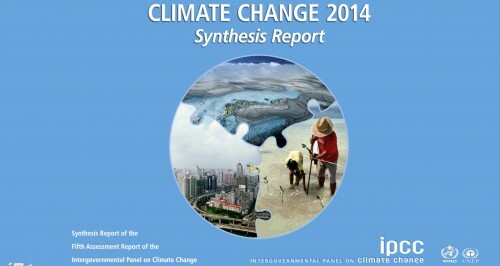 To read more about key findings in the Synthesis Report download it from the IPCC webpage.